during the meetings held December 9–11, 2010. Standards activity never stops as you will see when you read on. In this issue of the Standards column, we will review the last meeting of the IEC (International Electrotechnical Commission) Advisory Committee on EMC (ACEC). 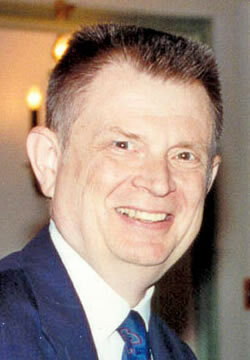 Finally, we are saddened by the loss of major contributor in our EMC community, Georges Goldberg. His short obituary and photo are shown on page 73. We hope that the colleagues of Georges Goldberg will have a moment to pause on remembering him and if possible to contact his family and friends. The International Electrotechnical Commission (IEC) Advisory Committee on EMC (ACEC) met at Siemens headquarters in Erlangen, Germany the first week in December. ACEC advises the technical management committee of the IEC, called the Standardization Management Board (SMB), on EMC issues that are brought to ACEC’s attention from a number of IEC technical committees that have EMC aspects in their standards. The two day meeting was well attended amid the pleasant decorations and holiday spirit in and around the meeting venue. 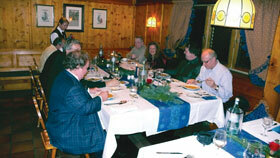 Chairman Diethard Moehr of Siemens was the official host of the meeting and at a get-together holiday dinner on the evening of the first day of the meeting at a nearby restaurant. 1) Can alternate test methods be allowed in a product compliance standard with equal validity? The SMB indicated that flexibility should be allowed to either have multiple methods with equal validity or selecting one that is the preferred. 2)	Concerns with the use of a new measurement instrumentation detector function – RMS-average – which was developed to better indicate the necessary interference level to digital communication receivers – to continue to show interference potential for certain types of products, especially analog radio services. Office, is shown in the foreground. a) ECMA provided a description of their work and voiced concerns on over testing product immunity and the progress in measurement procedures and limits for power line telecommunications (PLT) which is a service to provide internet access of the power line via conduction on the power line itself. 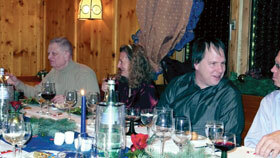 Chairman Moehr (second from right) toasts the committee with a traditional holiday “drink” at a dinner sponsored by Siemens. CISPR Subcommittee I chairman, Martin Wright of British Telecom chats with ACEC colleagues. His wife, Elaine is at his right side. Far left is CISPR Chairman Don Heirman, Don HEIRMAN Consultants. 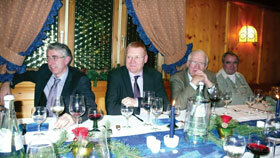 Chairman Moehr and the ACEC members and guests enjoy a traditional dinner. Clarification on the use of safety which is defined in the IEC as “freedom from unacceptable risk” which leads to terms such as functional safety when equipment reacts to its input operational signals. This is not to be confused with safety of equipment reacting to its electromagnetic environment which is generally discussed as immunity “safety” by the EMC community. Participation in the IEC supported training activity was endorsed by ACEC. Any IEC country can request such training. If the subject is IEC EMC standards, ACEC will be advised to see if the request can be accommodated by one or more of its members or another expert. The IEC will help in the arrangements and will pay the expenses of the speaker(s). There was a suggestion to have the request for the training be available on the IEC web site to make it easier for countries to file a request. This is being addressed. The CISPR chair reviewed the results of the last CISPR plenary meeting and subcommittee representatives presented updates on the progress on basic measurement methods and test instrumentation, generic emission limits (including those for TEM and reverberation tests), and the new multimedia draft standards covering both ITE and receivers as well as the activity on PLT. The TC77 chair described the results of the last TC77 plenary meeting and subcommittee representatives presented updates on the progress their low frequency phenomena (discussing power line harmonics in the range 2 kHz to 9 kHz), high frequency immunity phenomena including maintenance activity in many of the IEC 61000-4-X series, and high power transient phenomena with several of these standards under maintenance. Both series of presentations identified joint task force work between CISPR and TC77 including work on TEM test methods, reverberation testing, and measurement uncertainty basics. 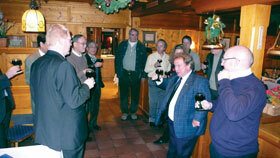 ACEC members enjoy dinner. 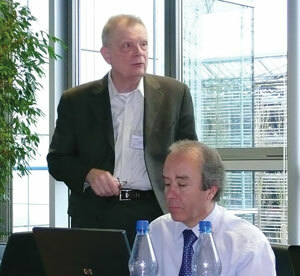 From left to right, Hervé Rochereau of EDF (France); Emmanuel De Jaeger of LABORELEC (Belgium); Lauri Halme of Helsinki University (Finland); and Anton Kohling, a CENELEC EMC Consultant. The IEC has become very involved in the Smart Grid activity. On their web site (www.iec.ch/zone/smartgrid/) is the breadth of the activity including identifying its related technical committees which includes CISPR and TC77 from the EMC perspective. To note another international activity, Don Heirman presented what the IEEE is doing with its project 2030 and in particular the input of the IEEE EMC Society to the Smart Grid activity. Clearly this is a “hot” topic needing the full attention of the EMC standards world as well as those of the power, communication, and data communities. The meeting spread over a three day period. On the last day, there was a tour of the Siemens EMC test facilities of the industrial and medical divisions of Siemens in Erlangen. 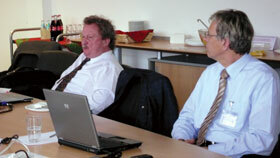 Dr. Jaekel and Mr. Sitzmann of Siemens were the hosts. We thank them for an excellent view of the impressive chambers and instrumentation.